It doesn’t surprise me that “taco night” or “taco day” is a tradition in a lot of families, schools, summer camps, and cafeterias. 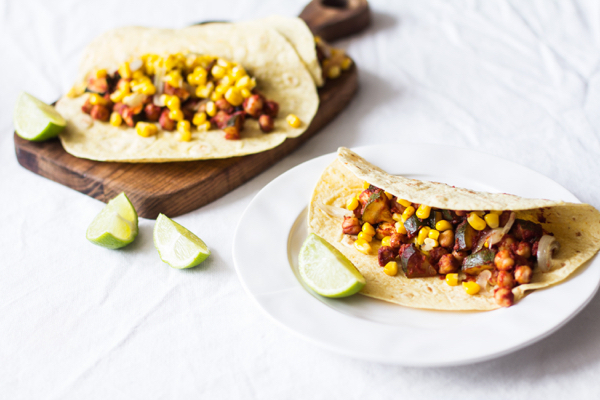 Tacos are a reliable crowd pleaser, and they present the home cook with plenty of opportunities to use up leftovers, work from the pantry, and get creative. 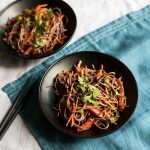 I tend to think that the most beloved and worthwhile recipes are the ones that can work as templates–you can shape them with whatever ingredients you have on hand. You don’t have to be too reverent if you want to put an unconventional spin on something. And you can make big changes in flavor and character simply by playing around with ingredients and spices. I’ve made vegan tacos with tempeh, tofu, lentil walnut “meat,” black beans, sweet potatoes, and cauliflower (look out for a cauliflower and oyster mushroom taco in my new book!). I wanted to keep these tacos simple, seasonal, and pantry-inspired, which is why I whisked together an easy barbecue sauce. If you keep a can of tomato paste and a bunch of spices handy, the sauce and the recipe come together pretty effortlessly. 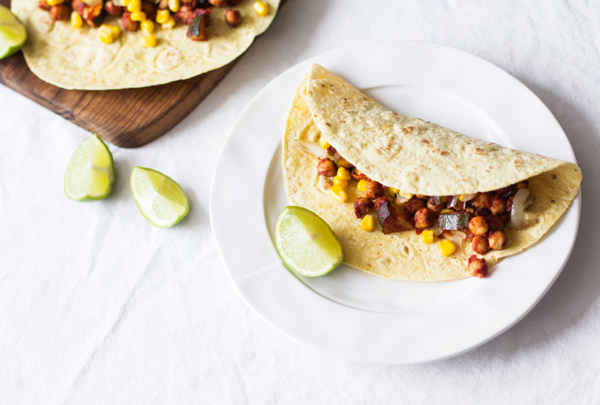 Soft zucchini and crispy chickpeas give the tacos most of their flavor and texture, but the addition of summer yellow corn adds color and compliments the sweetness of the rich barbecue sauce. You can use crispy taco shells or soft corn or wheat tortillas in the recipe. I find soft tortillas easier to eat and prefer the texture, so those are my go-to. 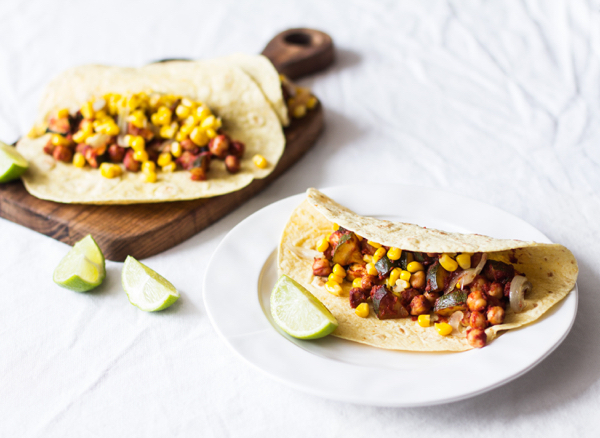 White corn tortillas are my favorite, but yellow corn is great too (or sprouted corn–Food for Life makes a good one). Tortillas can be warmed in a microwave or in an oven set at low temperature. 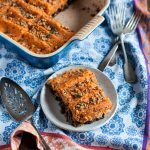 Personally, I love to heat them over an open, low oven burner–the hint of char and soft texture this gives you is really nice. But it’s up to you. 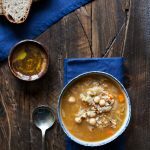 In place of chickpeas, you could use black beans, pinto beans, kidney beans, or black eyed peas in this recipe. The main thing is to let everything roast nicely, so that the barbecue sauce reduces and gets more and more flavorful in the oven. Bake on parchment, foil, or silpat, and don’t worry that some areas will look dark. Once you scrape everything up and stuff the filling into the tacos, you’ll appreciate the deep flavor–which is thanks in part to a touch of blackstrap molasses. Line baking sheets with parchment, foil, or silpat. Preheat your oven to 375. Whisk together the tomato paste, water, maple syrup, blackstrap molasses, tamari, apple cider vinegar, mustard or mustard powder, chili powder, garlic powder if using, and smoked paprika. Place the zucchini and chickpeas into a large mixing bowl. Add the barbecue sauce. Toss everything together so that the zucchini and chickpeas are smothered in sauce. Divide the vegetables onto your prepared baking sheets. Bake for 25-30 minutes, or until the zucchini is tender and the chickpeas are getting crispy. While the vegetables roast, heat the olive oil in a small frying pan over medium heat. Add the shallots and cook for 2 minutes, or until just tender. Add the corn, along with a pinch of salt and pepper and the lime juice. Saute for 4-5 minutes, or until the corn is sweet and tender but still crisp. If you're using soft tortillas, warm them in a microwave, over a burner, or pop them in the oven for a minute after the vegetables roast. To prepare the tacos, divide about ¼ cup filling into each tortilla. Top with two or so tablespoons of corn and a sprinkle of cilantro. Serve. Yum. These tacos are so satisfying and delicious. Steven and I gobbled them up, barely pausing to say much other than a few contented “mmmm’s.” Needless to say, our contented silence was a sign of how much we loved the recipe. You can serve the tacos with a big, fresh salad, a jicama or cabbage slaw, a batch of fresh gazpacho, or a tortilla soup. No matter how you serve them, I hope you’ll enjoy them as much as we did. 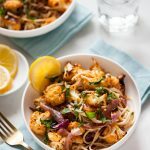 This Friday, I’ll be back with a quick and (I hope) useful post on a topic that so many of my clients and readers have questions about: protein! Until then, I wish you a happy hump day. 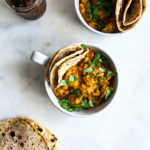 The roasted zucchini and chickpeas alone looks amazing already and no doubt that once these are assembled on the taco shells, it’s going to be a hit! The corn definitely compliments the texture and the colour as well. These look fabulous! I’m definitely going to try the bbq sauce on other recipes as well! Looks so delicious! Your blog is wonderful, so glad to have found it! I’m so glad you like it, Deb! Welcome.